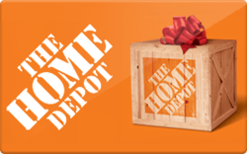 Gift Cards work at any Home Depot retail store or online at homedepot.com. These discounted gift cards can be used along with promo coupon codes, sales, military and moving discount. Instantly save on home projects you're working on by investing in a discounted giftcard. You can also find a 10% off coupon on eBay which you can combine stack with a discounted gift card.